The current keyboard layouts (QWERTY, AZERTY..) were created to prevent overlapping of letters when typing on mechanical typewriters. This mechanical limitation is no longer valid, so it is quite logical to imagine a more efficient keyboard. In August 1936, Dvorak is the first (with his brother William Dealay) to imagine a keyboard optimized for user comfort and analysis of the frequency of the use of characters. In fact, the most commonly used letters are placed along the middle line (home row) of the keyboard. 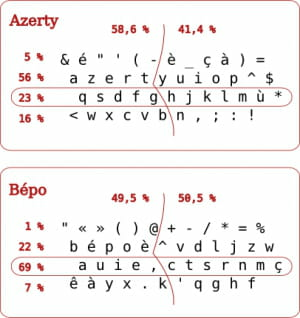 The BÉPO keyboard layout is optimized for typing French and programming languages ? ?on computer keyboards. The organization of letters and symbols is the result of a statistical and ergonomic study which tends to reduce the movement of hands during touch typing. All the mostly used characters are on the home row. How to master the BÉPO keyboard? Simply install the driver for your system and change the default keyboard layout. A portable version of the drivers also exist. After configuring your keyboard, you'll find that the most frequently used letters are within the range of your fingertips and that you can quickly start typing simple sentences. A short adaptation time will be required, however the logic of the arrangement of letters should allow you to type faster and in a much less tiring way. The ultimate goal of the Bépo keyboard is of course to make the AZERTY keyboard obsolete, but it won't be so easy. For further information: The official website of the Bépo keyboard. Photo credits: bepo.fr (under free license: C-BY-SA & GFDL). Published by deri58. Latest update on October 21, 2013 at 10:30 AM by deri58. This document, titled "BÉPO - A keyboard layout optimized for the French language," is available under the Creative Commons license. Any copy, reuse, or modification of the content should be sufficiently credited to CCM (https://ccm.net/).